In nature, rabbits are an integral part of ecosystems throughout the world. From the vast Sonoran desert of North America to the Arctic tundra of Greenland, they have adapted to nearly every climate that the Earth has to offer. Closely related to rodents, they exhibit physical features and behaviors that are truly unique among the animal kingdom. As strict herbivores, they feed primarily on grasses and other succulents. If highly nutritious foods are unavailable, rabbits will re-ingest one form of their excrement, known as “cecal.” As distasteful as this may sound, it is a critical aspect of their survival. Whereas vision is our primary sense of perception, acute hearing is most vital to a rabbit’s survival. Twisting and tilting their elongated ears, they can easily detect potential predators in the distance. But exceptional hearing is only one of their many tools for survival. Their eyes are widely spaced, allowing for a nearly 360° field of view, while their long and narrow hind legs give them the ability to run at speeds up to 35 mph! If danger is detected, they firmly thump their hind legs on the ground to warn their family in the tunnels below. Joy was found in a box with another bunny in San Francisco. She was likely being raised to be eaten. Photo by Tara Baxter. Well known for their reproductive potential, mother rabbits (does) take great pride in preparing their nests and nursing their young (kits). An average litter consists of 5-6 kits who are furless, deaf and blind at birth, except for hares who are born with fur and are able to hop minutes after birth. As a testament to the rabbit’s resourceful nature, their nests are composed of grasses mixed with fur that the mother removes from her own body. Male rabbits (bucks) play little to no role in the rearing of the kits. Much of their time and energy is devoted to fighting for the opportunity to mate. Anyone who has spent time with a rabbit will quickly appreciate their gentle and inquisitive nature. A prime example is their insatiable desire to groom. Although self-grooming is essential, mutual grooming is a common show of affection and an important aspect of their social order. If they feel safe, males and females will take turns gently licking each other on the forehead and about the ears. The recipient softly grinds his or her teeth with content. Another common behavior among rabbits is the chin rub. Using special scent glands on the underside of their chin, they extend their head and intently rub their chin on objects they like. It’s no wonder that many ancient cultures held rabbits in high regard – often referring to them as spiritual leaders and the epitome of innocence. 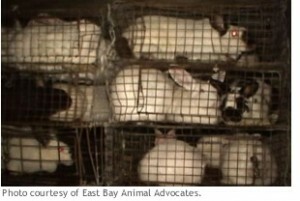 In industrial animal factories, rabbits have an extremely unnatural existence. Rather than exploring meadows and grasslands like their wild relatives, these rabbits are restricted to small cages that barely allow enough room for a single hop. For an animal who is built for speed and agility, this confinement is indisputably cruel and unnecessary. Their lives are essentially reduced to converting cheap hay into highly profitable “meat” and fur. Like all industrially farmed animals, their instincts and general well-being are thoroughly compromised. Today, nearly all rabbits raised for “meat” are descendents of the old-world species Oryctolagus cuniculus. The most common breeds used in the U.S. are the New Zealand white and the Californian, or hybrids of the two. They are the most desirable breeds due to their relatively large size and white fur, which is highly valued in the fur trade because it can be easily dyed. These conditions are strikingly similar to those of hens who lay eggs that are confined in “battery cages.” It should come as no surprise that this extreme confinement is not only mentally debilitating, but also leads to poor physical health. Sick and injured rabbits often go unnoticed and rarely receive veterinary care. While outdoor “rabbitries” do not pose the same ventilation concerns as indoor rearing, they do present an equally harmful situation: the threat of predation. Rabbits confined in cages are vulnerable to a variety of persistent wild predators. Even if they are unable to breach the cage, a predator can easily trigger a fatal heart attack. In addition, rabbits confined outdoors are unable to act on their instinct to shelter themselves from harsh weather. Rabbits are extremely nurturing, intelligent and curious animals. They have very simple needs, but like other industrially farmed animals, those needs are crucial to their survival and general well-being. In the wild, rabbits eat a large variety of plant material, including herbs, grasses, leafy greens and fruits. In industrial animal factories, they are commonly fed exclusively hay. In the wild, they form extended communities and look out for one another as they explore the diverse landscape. In industrial animal factories, they sit in wire mesh cages day after day, breathing ammonia fumes. No animal deserves to have his or her nature suppressed to such an extreme. Please reject this and all products of oppression by adopting a vegan lifestyle.